With those words I hear Handel’s Messiah with a choir ringing in my ears with the words sung over and over, “For unto us a child is born, unto us a son is given…” It was the reality of those words that landed us in Brazil as missionaries, and there our celebrations of Christmas were different than any we had known. 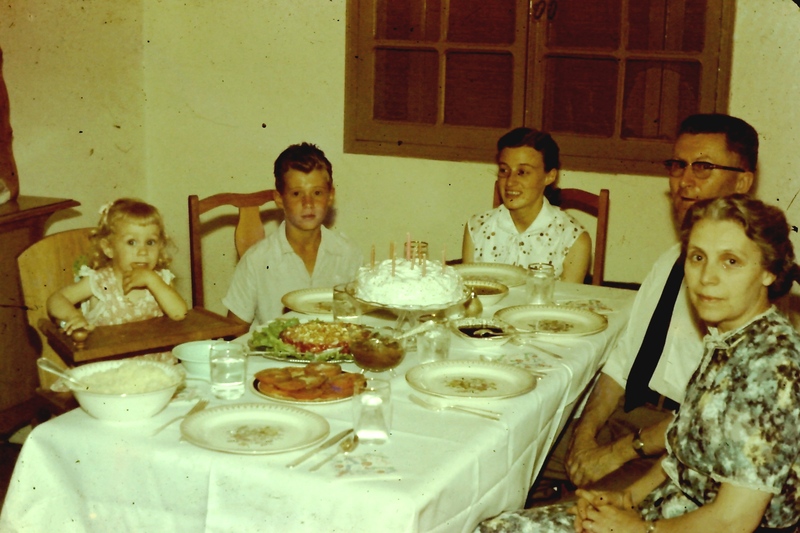 When I checked with Doris about our first Christmas in Brazil—that was 1955–Doris said, “I don’t remember. Our ears and eyes and minds were busy with learning the language.” We were the only ones in our mission so we spent Christmas alone with our baby girl, Monica. But I don’t recall being lonely perhaps because we were on the greatest adventure of our lives. 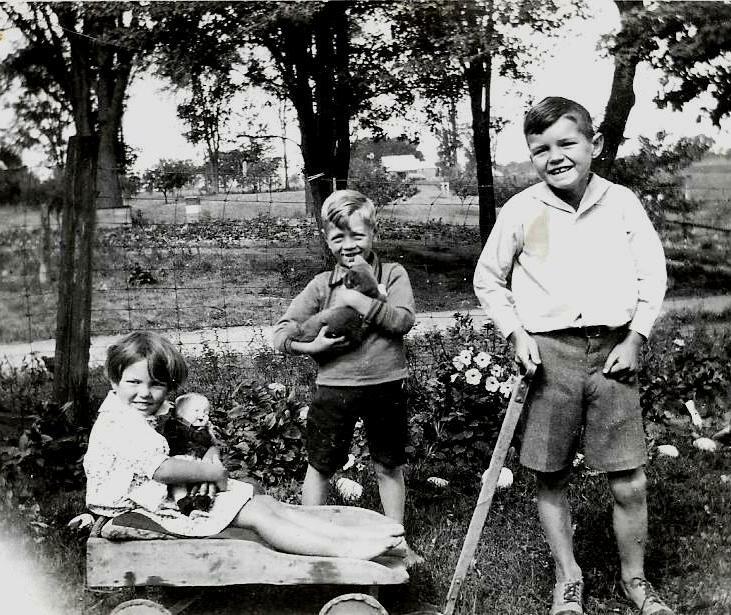 After that year we moved to Rio Preto in the interior of the State of São Paulo with Murdo, Isabel and Ross Campbell arriving there just before us. It was a Christmas gathering at their home that Doris and I will never forget for we could chat in English and not struggle with our Portuguese. As we relaxed around the table we looked for Monica who was about two. It seemed impossible that she had escaped to the busy street a few feet from the home. Somehow she had climbed a wrought-iron gate at the front door and when we looked we saw her standing in the middle of the street with traffic passing on both sides. I screamed a prayer out to God and ran to pick her up. But for the grace of the Eternal Father who sent his angels to put their wings around our little girl, there could have been a tragedy. After a year or so when the Campbells returned to Canada, we moved to the small village of Neves Paulista in the midst of coffee farms. It was not long before we became so involved in planting a number of congregations that we came to Christmas with no energy for a family celebration. Too busy to get a special Christmas dinner ready Doris brought out the leftovers for us while we remembered the turkey and deserts enjoyed by our families in Canada.. Nor could we find money for presents for Monica and Vernon. At that time our children would not have objected for they had no memories of better times. The village of Neves was poor with few decorations to remind us of the season. We were doing missionary work and it demanded our all—perhaps too much. But there is evidence that we left a mark on lives for the Christ of Christmas, at least I suppose so for the following Christmas one of the families gave us a piglet ready for roasting. A little pig for Christmas took the place of a turkey—a custom that made sense for turkeys would have been hard to find. Perhaps it was that same Christmas that folks from a farm gave us a half sack of mangoes. After furlough we were assigned to Rio de Janeiro to plant a church and since no other missionaries were nearby we celebrated Christmas by ourselves but quite differently. Most churches of whatever stripe would have their services at midnight and then the folks would return home to have their Christmas dinner in the wee hours of the morning. But Doris packed a lunch for our small family and we travelled up and over the mountains to enjoy the hot sun, the surf and sand of a quiet beach. At that time and place there was not one person in sight to notice Monica and Vernon playing in the water and building sand castles. Perhaps it was not on that Christmas day but I do recall leaving our spot on the beach to swim across the mouth of a small river and there finding oysters on the rocks. So we were faced with the challenge of a meal of fresh oysters although none of us have ever been excited about oysters, especially when raw. I then swam across this small river with the children on my back—one at a time—to pry oysters from the rock with as tire iron, then crack them open and eat them there. Doris is not a swimmer so she was not able to get to those rocks nor did we bring any back for her for I doubted she would eat them. Doris had our Christmas dinner laid out on a blanket on the sand and although it was nothing fancy, just a picnic with our toes close to the water and the surf rumbling in our ears. Yet it is a Christmas that I wish the four of us could repeat once again on that beach. Nostalgia for those Christmases long past bring tears close to the surface. Then, yes then we remember the joy of every Christmas, the birth of our Lord of which the prophet Isaiah spoke, “Unto us a child is born, unto us a son is given…” With faith we look beyond the best of any celebration here to an eternal one that has no ending. This entry was posted in Uncategorized on December 25, 2017 by rkenny2014. Sixty plus years ago times were tough in Brazil. Money was scarce especially for a young couple, Rev. 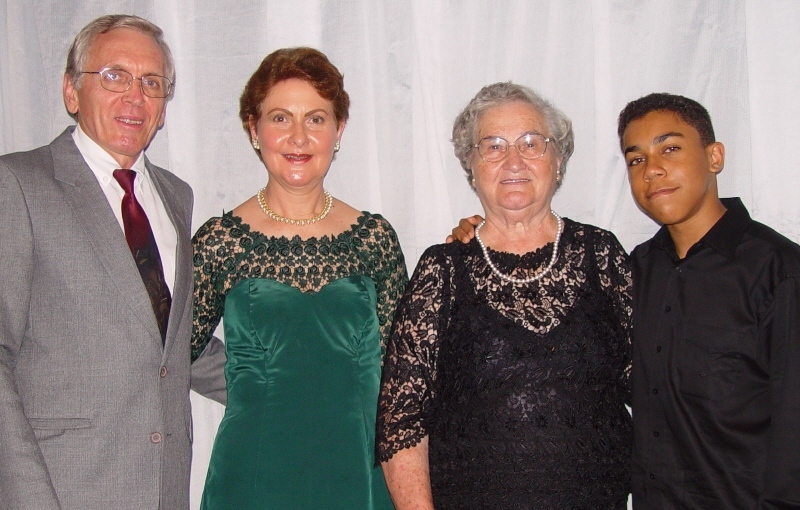 José and his wife Irene who were planting a church in the outskirts of the city of São Paulo. They were facing a bleak Christmas for they needed to set aside money for surgery on their five year-old daughter Cleide. Their surgeon had recommended surgery on an umbilical cord hernia for she would begin school the first of the following year. And though the surgeon promised that he would not charge a fee, yet the hospital needed to be paid. Pastor José and Dna Irene with daughter Cleide about this time of financial need. With no money, José and Irene went to a Japanese friend for a loan and promised to pay it back month by month. But that meant there was no money for Christmas. Nothing! It was Irene’s practice each Christmas to buy her husband a fine white shirt but this year she explained there would be no such gift. Generally Irene would take his old shirts and turn the collars to hide the wear, however this was not an option that Christmas for every old shirt José had was already reworked as much as possible. Irene laid out her dilemma of having no shirt to give at Christmas and with that José replied, “Don’t be sad Irene; all the shirts in the world belong to God. If He wishes to provide a shirt as a present that would not present a problem.” So in prayer José and Irene laid the matter of a shirt before the Lord. A few days later, still before Christmas day, a sister to Irene who lived nearby saw that a truck moving a family had dropped a bundle in front of her house. She checked for the owner and watched for any truck looking for a box—but no one came to claim it. Opening it she found fine linens and shirts. Her husband and others of the family tried on the size 37 shirts but they found out that not one fit. Then thinking of José she brought the box to him, wondering if there might be somebody in the congregation that could use them. Just the moment when Irene saw the shirts were José’s size she started to cry for she was sure the box of ten shirts was sent by God. The shirts, most of them almost new fit José exactly. Pastor José had more good shirts on hand than ever before in his life. She then told the story of how José had declared God owned all the shirts in this world. God had provided not just one shirt but many shirts for Jose’s Christmas. Still, the story has not ended. Remember the little girl Cleide that had surgery? Well, later in life she married Luiz Roberto who had grown up in abject poverty and later with his talent in music has sung in citywide crusades. Now get this—ever since he became José’s son-in-law until the moment I began to write this blog, he has never had to buy a shirt. Years later this is the family who experienced the Miracles of Shirts. Luiz Roberto, Cleide, Dna Irene and Ivan. At this time pastor José had passed on to his eternal reward. But the miracle of the shirts has not only touched Luiz but that of his son Ivan. Cleide told me that she gets so many shirts for him from a variety of people—yes, so many shirts that she has to give some away. Apparently the answer to José and Irene’s prayer of faith is that the blessing of shirts falls from one generation to another. There is more! One day Luiz Roberto was chatting with the pastor who had followed José and he told Luiz Roberto that through the prayers of José, that the same blessing of shirts came to him. This entry was posted in Uncategorized on December 21, 2017 by rkenny2014. I’ve always wondered since that time years ago what might have happened to me if our neighbour Joe had not come with his axe. As I tell you this story you will see that the time and happenings are all in God’s hands. His angels are quick, so very quick to be involved. And you’ll understand why I write about such a crisis, for if it had gone the other way, I’d never made it to Brazil. 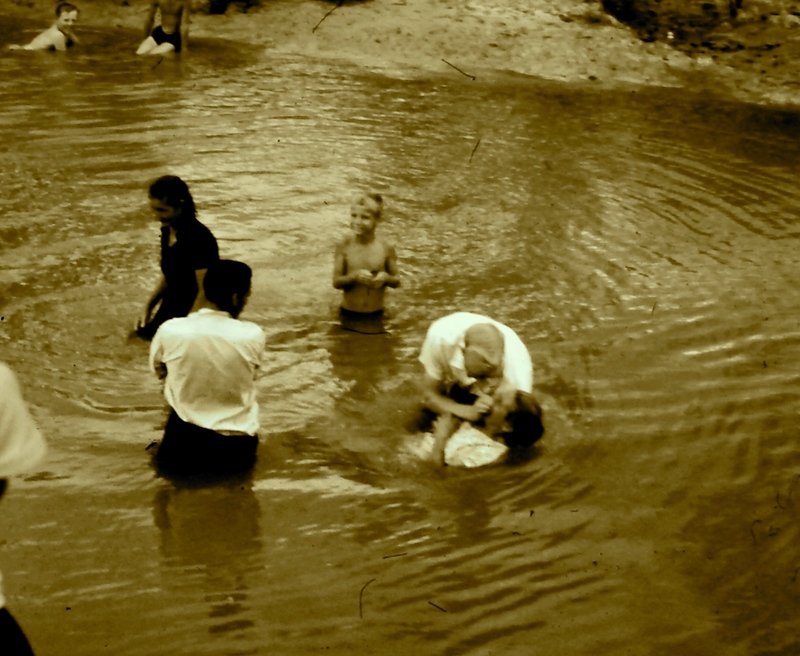 A baptism in the interior of São Paulo state where we lived and ministered. what a privilege to be in Brazil and encourage folks in following Jesus as Lord and Saviour. It was the spring of the year when my sister and I formed a simple conspiracy to explore the new farm my dad had bought. Each night a white frost laid its touch on grass and trees making this the right time of the year for Maple trees to lend their sap to make syrup. About a ten minute walk for our young legs—she was about nine and me ten at the time—and those legs took us back across the brown stubble of a hay field towards a dark woods. We by-passed the swamp and Dog Lake to follow the farm trail around a huge rock cliff then up the hill. On more level ground we followed the line fence with its row of Soft Maples. This picture is a few years before this story unfolded, but there is Alma my sister, myself and a cousin, Hollis Mainse. Pictures are scarce from that time. That was when the trouble began for I had watched my dad boil down the sap from Sugar Maples to make the sweet syrup. One of those trees had a streak of sap marking its trunk; that was an invitation for me to try its sweetness. Since it was sweet I surmised wrongly that it might be sweeter closer to where the sap oozed from the bark. A new purpose sprang into my mind. I’d climb that tree but I never thought it would make me pay for the taste I’d taken. You see the Soft Maple is set apart from the Sugar Maple for the trunk often divides into a very narrow V.
That is the way it was that day. I was about ten feet up in my climb when I placed a foot in that narrow crotch though that was no problem. But when I put my weight on that foot to climb further the tree grabbed my foot so securely I could not get it loose. My sister watched my struggles from below till I fell over backwards with my foot held more securely in the bite of those arms of unyielding wood. My sister could not reach me and even so she would not have been able to lift me to be released. I was becoming desperate. “Run, get mother ,” I cried out. With that she headed for the house and though it was a long hike for her within the half hour mother returned. Though mother could reach me yet there was no possibility of removing my foot especially since it was more painful by the minute. Her solution was to return to the house as fast as she could, cross the road to another farm house and explain her problem in gasping breaths to Joe. It must have been another half hour before Joe and his axe made his way with mother back cross the fields, up the hill to the tree that held me prisoner. But the pressure on my foot and my suffering meant only one thing—cut down half of the trunk that held my foot. I’m vague about this part of the story but of this I am sure, Joe laid all of his strength into making those wood chips fly. Soon I was on the ground and hobbling towards the house—with a red face. You see, with my head down for at least an hour the blood that had been forced into my skin and remained there. Even after a couple of days I still had something of a red face though part of that might have been embarrassment. Dad had been away that day but when he returned and heard the story his response was, “I’d have gotten him down. No need to cut that tree.” To hear that almost made me faint for I felt once again my twisted foot pinched between the parts of the tree trunk. There are questions I’ve asked myself during the seventy-five years since that painful escapade. Why was it that mother that day did not go with dad on his errands and as a result leave me alone hung up in the tree? I wonder why my young sister was with me for often I explored that farm by myself. As well, since farmers are always busy how did it happen that Joe was not out of reach of my mother, perhaps working in his back forty? This entry was posted in Uncategorized on December 13, 2017 by rkenny2014. The sunshine of old memories enlightened my sleeplessness a few nights past. Awake for a few hours I went to a reclining chair where often I can sleep and not disturb my good wife Doris. Frustrated by continued sleeplessness, I picked up an old hymnal dated to the 1940s. The opening words from a song threw open a door to angel wings that whispered to me of how those angels kept me alive when I should have died. Those words begin with, “Dear Lord, take up the tangled strands where I have wrought in vain…” So what is the story? It occurred during a break from classes when I was in Bible School in Brockville, a time when the boys went outside to horse around on the lawn. I was involved in some wrestling when the other older chap dumped me on my head. Immediately I did not know who I was or where I was. Nothing but darkness and confusion. Yet somehow old habits led my feet to my room. Then my friend Colin from across the hall, began to play his guitar and sing the words that I’ve mentioned. I knew the “tangled strands” fit me for I had no certainty if those “tangled strands” would ever come together. Would my life form anything more than a blank slate? I felt my short life was summed up in, “…where I have wrought in vain.” I had no inkling that I would ever recover. However by the next day I was able to be back in class but groping along disorientated. Some are going to say that my confusion continues. Oh well! The story continues though it goes back some ten years earlier when I was eight or nine. On that day God sent his angels to slip their soft wings under that boy’s life, my life. My sister and I along with another chap about my age were playing in our cow barn one summer’s day. There was a manure bucket that we called a “litter carrier” that ran on a heavy cable from the cow stable to dump far from the barn. With a strong shove it would leave the barn to dump is load and then return. Well, during the summer it was dry and we played shoving it and also bouncing it on the cable–that was until it jumped the cable and fell on me. 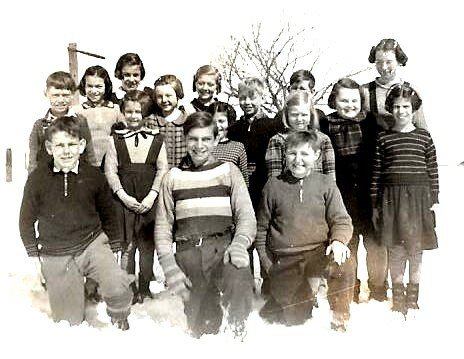 There I am in the back row with the rural school–at about the age of the accident. A long bolt that held a pulley in the carriage that ran on the cable, penetrated my skull leaving my left side paralyzed. After they got me to the house, I lay on the couch unconscious and bleeding– during the evening meal, during the milking and the time when dad and mother went to a prayer meeting at the church. Much later I was told that my older brother who was having supper, was overcome with the sight of blood and he fainted backwards with his chair. In those days many people including my dad were afraid of being ripped off by doctors and hospitals. 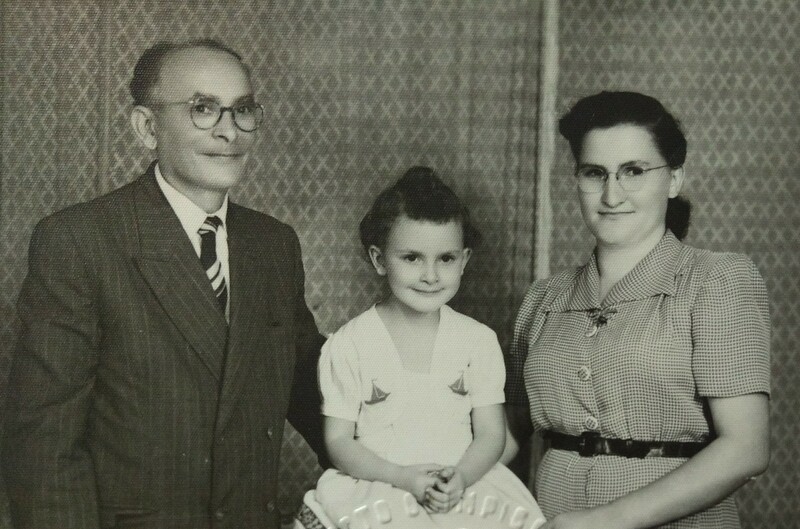 I imagine my mother’s tears insisted they get that unconscious body– to a doctor in Gananoque. He sent them to the Kingston General. With surgery the next day they removed the circular piece of skull pressing on the brain and cleaned up the mess the dirty bold had left behind. That was before any antibiotics. Doctors said that cartilage would form over the place of surgery that extended across half of my skull. And that did happen though for years if I rubbed a finger over that scar, I would feel it down my left side. So why include this in blogs about Brazil and our time there as missionaries? Simply this. In some ways I felt that my life had been spared to fulfill some divine purpose, though that was years before Doris or I had any inkling the other person existed. Those angels were putting pieces into a puzzle that perhaps only God in heaven knew about. Some details. As I was finishing seminary our church suggested we go to Brazil as missionaries. I look back now, when I am just now weeks away from my eighty-seventh birthday and see the plan of God in the accident. Yes, and I hear the whisper of angel wings. You see I could easily have died for doctors explained to my parents that the bolt had barely missed large blood vessels and with that miss, my life was spared. Now any blow to my head can create a problem similar to what I mentioned. This entry was posted in Uncategorized on December 5, 2017 by rkenny2014.